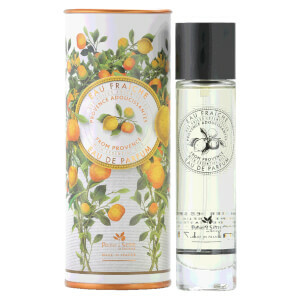 Discover The Essentials Provence Essential Oils Eau de Parfum from Panier des Sens. Expertly blended with essential oils and plant extracts recognised for their herbal and aromatic properties, the bright, sparkling fragrance combines zesty Lemon accords with Mandarin, Sage and Petitgrain for a refreshing olfactory experience. The perfume settles on a Cedarwood and Musk base. Housed in beautifully decorated packaging. Heart Notes: Mandarin, Pink Pepper, Petitgrain. Base Notes: Artemisia, Cedarwood, Musk. Alcohol Denat. Sd Alcohol 39-C, Aqua (Water), Parfum (Fragrance), Limonene, Ci 14700 (Red 4), Ci 19140 (Yellow 5), Benzyl Benzoate, Citral, Citronellol, Geraniol, Hydroxycitronellal, Linalool.